Though the state may be small, Delaware is experiencing the similar quick growth in medical support jobs as the rest of the country. Though the state of Delaware doesn't set forth any specific requirements for medical assistants, they can receive additional training in administering medications. 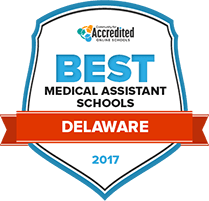 Learn more about what students can expect from accredited medical assisting schools in Delaware, the salary they might receive upon graduation, and other important considerations when choosing medical assisting in Delaware as their profession. Delaware has a number of opportunities for those interested in the health care field to start a career as a medical professional. Earning a degree in the field is the first step in career advancement, where graduates can go on to work in medical facilities and physician offices. Medical assistants often greet patients and take vital signs, schedule appointments and ensure that medical charts are in order. But finding a quality program that meets your needs can be a challenge. We’ve taken a look at cost, class size, student services and other factors to bring you the Top Medical Assisting Program for Delaware in 2017. Students enrolled at Delaware Technical Community College on their Stanton or Wilmington campus may pursue an associate degree in medical assisting. The medical assisting field is growing in popularity, and it is DTCC’s goal to prepare students for successful job placement in this field. Most credits earned at DTCC may be transferred to other institutions of higher education, allowing students to relocate if they need to. DTCC also hosts a wide variety of student clubs and organizations on all four of its campuses, including Greek life chapters, athletic clubs, and student government opportunities. Students intending to earn a certificate or degree in medical assisting in Delaware need look no further than these potential schools. This search tool can help students narrow down the options to choose the school or program that is right for their needs and goals. As of early 2016, there was only one school in Delaware offering an accredited program in medical assisting. There might be other schools currently seeking accreditation; always check with the Commission on Accreditation of Allied Health Education Programs (CAAHEP) to ensure a program is accredited. Delaware Technical and Community College offers many healthcare-related options, such as medical assisting. Most associate degree programs are designed to help students seamlessly transfer to a four-year college as a junior and obtain their bachelor's degree. The medical assisting program provides students with an associate degree that prepares them for a full range of administrative and clinical tasks as a medical assistant. The associate degree program also produces well-rounded students, thanks to general education requirements. How does Delaware define "medical assistant"? The state of Delaware does not define medical assistants, nor set forth any rules or regulations governing them. However, the state does make it clear that nurses can delegate certain tasks to unlicensed assistive personnel, which would include medical assistants. Medical assistants might also choose to become trained in Limited Lay Administration of Medications (LLAM), which could broaden the scope of what nurses can delegate. Delaware does not require certification for medical assistants. 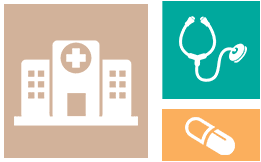 However, many employers prefer to hire those who have earned certification, as it speaks to a minimum level of knowledge that is necessary to keep offices and other healthcare facilities running smoothly, as well as a grasp of minimum patient care. Is formal education and/or training required? Are there tasks outside the scope of medical assistants in Delaware? Medical assistants in Delaware make slightly more than the national median wage for medical assistants. Those who are certified might fare better when it comes to pay and job security. Below are the national and state figures for comparison. Many factors come into play when salary is at stake; these include training, certification, years of experience and more. Another factor is geographic location. Typically, areas with a larger population will offer higher pay for medical assistants, but this is not always the case. The following chart illustrates what medical assistants in Delaware can expect throughout the state. The growth of medical assistant employment in Delaware is expected to move slower than the national average in the coming years, but still at a brisk pace. The chart below offers a more in-depth look. The Washington, D.C., Delaware and Maryland state society is supported by the American Medical Technologists and provides a way for medical assistants to get involved in their profession and community. Delaware has no laws explicitly outlining the scope of practice for medical assistants. However, the laws regulating nursing practice allow nurses to delegate certain tasks. This frequently-asked-questions page gives details on what medical assistants must do in order to become eligible to administer some medications to patients.